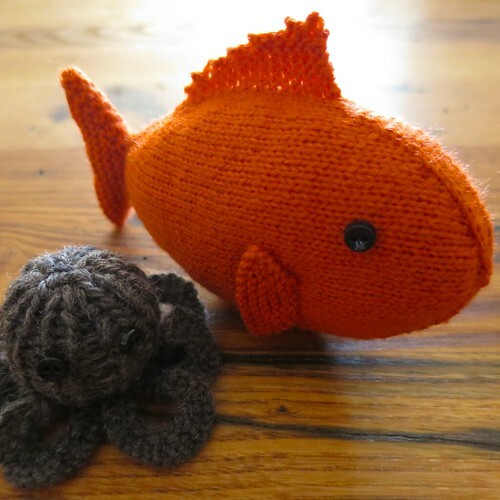 So, you may remember a couple Iron Craft challenges ago I knit up an octopus and a starfish. 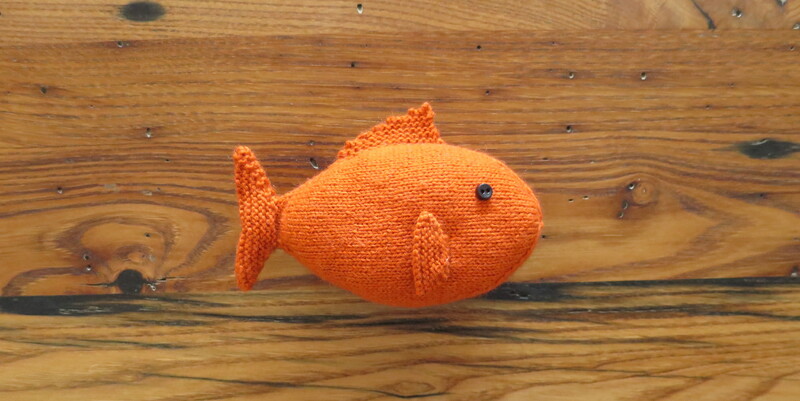 My original plan was to also have a fish to complete the set, but time ran out and I only had half a knit fish. When I got back from vacation, I spent and afternoon finishing him up. 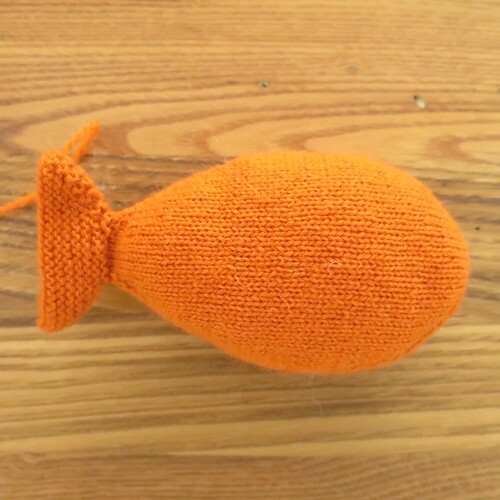 The fish body and tail are knit in the round and stuffed as you go along. The only seam is to close up the tail. Fins are added by picking up stitches and knitting them in place. 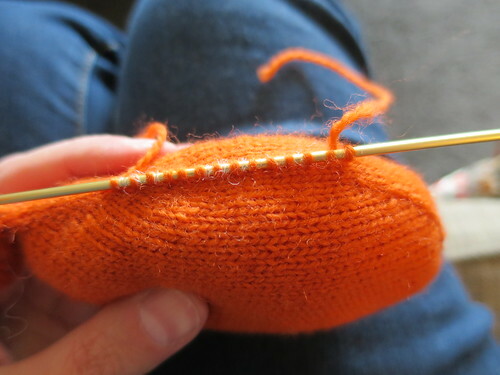 Gauge is not important for this pattern, but you want to knit tight enough that the stuffing doesn’t show through. My gauge was about 10 stitches per inch and my fish was 5 ¼” long. More stitches per inch will give you a smaller fish, less stitches per inch will give you a bigger fish. Cast on 50 stitches. Divide between three needles. Join together to knit in the round being careful not to twist your stitches. Place a stitch maker between the first and last stitch to mark rows. Start stuffing the body of the fish. Continue stuffing as you go along. If you are using safety eyes or sewing on eyes do it now. Add anymore stuffing needed in the fish body. Cut your yarn leaving about a 10” tail. Place on a tapestry needle and weave through the 14 stitches on the needle. Remove needles and pull tight to close the hole. Weave in the end. At this point you’ll have something that looks like a goldfish cracker. Pick up and knit 14 stitches along top of back of the fish body. Pick up and knit 5 stitches vertically on the side of the fish body. I placed mine a little bit below the middle and slightly towards the face. Repeat on the other side of the fish. Seam the opening on the tail shut. 5 years ago by Kat in Knitting , Knitting Projects , Needlecraft , Projects | You can follow any responses to this entry through the RSS feed. You can leave a response, or trackback from your own site. Lucas says that is “so cool” We love it!! Hello. I was wondering if you ever grant permission to sell the finished product, as long as I would give you full credit for the pattern? I am a hobby knitter but I do like to cover materials. Do you have a pattern for the cute little octopus? Hi. I’m making this fish. Should i pull the fish inside out before stuffing?? 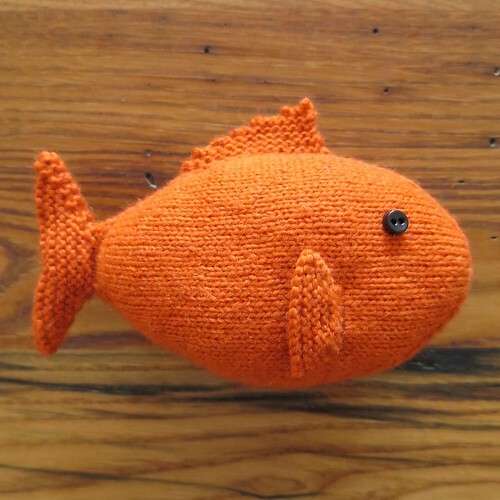 Because you are knitting it in the round it should already be right side out, the knit stitches on the fish’s body are facing out) and there is no reason to turn it before stuffing. That said, there are some people who knit in the round inside out, the purl stitches are on the outside, those people would probably want to turn the right side out.